Philip McLaren was born in the family home at Redfern, NSW, one of seven children. He's a Kamilaroi man, and both his parents are Kamilaroi from Coonabarabran in the Warrumbungle Mountain region of NSW. As far back as he can remember he has always been an artist and a storyteller. 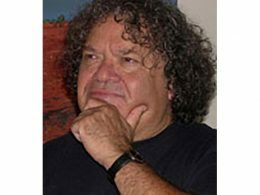 His first novel, Sweet Water - Stolen Land (University of Queensland Press, 1993; revised edition Magabala Books, 2001 ), won the David Unaipon Award for Black Literature. A work of fiction set in 1869, it is based on the true accounts surrounding the brutal settlement of his clan's ancestral lands. This book is about land, art, love, lust, religious fervour, massacre and hope. It became a national top-ten bestseller and is translated into Japanese. His second book, Scream Black Murder (HarperCollins, 1995; revised edition Magabala Books, 2001), is a crime novel set in the present day on the black streets of Sydney. A serial killer is murdering black women and white Australia doesn't care. It takes on important social issues and was short listed for a Ned Kelly Crime Writers' Award. It has also been translated into French and distributed throughout France, Switzerland, Belgium, Quebec-Canada, Polynesia and Africa. His third novel, Lightning Mine (HarperCollins, 1999),is a thriller, set in the present day and concerned with the mining of sacred Aboriginal land, and the inspirational fight to stop the desecration by the traditional custodians of the Lightning Spirit's resting place. There’ll be New Dreams (Magabala Books, 2001) is set primarily in the 1950s and 60s. It has been translated into French and released in France, Switzerland, Belgium, Quebec-Canada, Polynesia and Africa. It is also translated into German. Philip has participated in four Creative Writing tours to outback Aboriginal communities. He has delivered numerous lectures and readings including those for University of Alberta; University of Sydney; University of Technology Sydney; University of Wollongong; National Library of Australia, Canberra; State Library of NSW; Mitchell Library, Sydney; Stanton Library, North Sydney; Brisbane Writers Festival; Melbourne Writers Festival; Adelaide Writers’ Festival; Sydney Writers’ Festival; Sydney Writers’ Centre Spring Festival; Byron Bay Writers Festival; New Zealand’s inaugural Toi Maori Festival; the inaugural Salon International du Livre Océanien in New Caledonia; and was invited by the Goethe-Institut to speak at their inaugural Writers’ Festival at the Haus Der Kulturen Der Welt in Berlin, and more.